Hers are velvety dark landscapes in high contrast, pulling you to the distant horizon of a rolling wheatfield. His stained glass patchworks of rich oil color on canvas evoke the feeling of light on land, yet function formally as a rhythmic expression of color, shape and line. Together at Chase Gallery through June 27, Katherine Nelson and William Turner articulate eastern Washington’s beloved palouse. Turner’s The Valley Series soloed at Port Townsend’s Northwind Art Center Gallery last year. His ties to the Westside include an extensive exhibition career and an MFA from University of Washington, where he studied under Jacob Lawrence. 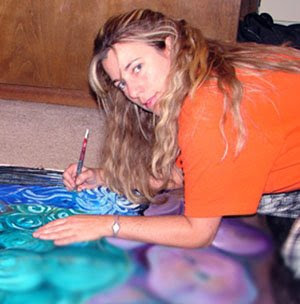 Nelson is represented by The Art Spirit Gallery in Coeur d’Alene, where she regularly exhibits her evocative landscapes. Round Mound is typical of Nelson’s sensuous line quality and meticulously rendered patterning that suggests tree, wood, brick or undulating rows of tallgrass. What a wonderful way to usher in spring and celebrate our northwestern landscape. I'm FROM North Idaho, where I teach public school art, write about art and (try to) develop my own artwork. Before that, Montana (sort of), California, Pennsyslvania, New Jersey, Germany, New York, Georgia--some places more than once--and a bunch of places in between. • I'm FROM a life lived with art... the artwork my parents collected with meager savings, explorations of galleries from here to the east coast, undergraduate work in mixed media and sculpture. I've made a living with my art: marketing and design, graphic illustration, art, journalism, and sundry odd jobs that make for interesting stories but never captivated me as much as teaching, which I love. But, more than that, I've made a LIFE with art. • So I'm FROM a place where art is a valued thing, a hallmark of culture, an expression of our humanity in all it's peaks and valleys. I'm from a place where art is a way of viewing the world and my place within it. Questions? Comments? Events you'd like to see covered? Spokane Arts Org "Visual Arts"